These 812-area restaurants offer wholesome eats. A hearty, farm breakfast is something Hoosiers know well. We scoured Internet reviews and consulted friends to find three mom-and-pop breakfast spots in the 812 area that serve filling meals to get you ready for whatever adventure you have in store. What to expect: Storie’s has sat on the south side of the square since 1977, and it looks like it. It has an old-fashioned counter, but if you sit by the front windows, you’ll see the famous tree growing out of the courthouse. Breakfast is only served until 11 a.m. here, so show up early. What to order: Try the Western omelet with cheddar cheese, green peppers and your choice of meat. The biscuits crumble perfectly, and the gravy has the right amount of sausage. If you miss breakfast, try the most popular lunch item, the breaded pork tenderloin. If you’re still hungry, Storie’s is famous for its pies. What to expect : Located in a historic downtown building, Main Café’s plain, bare-bones decor contrasts with its ornate walls and ceilings. Kiwanis Club banners line one wall. Since it’s one of the only breakfast spots in the area, a lot of locals hang out here. You’ll get friendly, quick service and large portions. What to order : Pancakes are its best-seller and an employee favorite. And there’s a reason — they’re made from scratch and fill up a plate . You could try the omelet, but you’ll be full from their pancakes. What to expect : Unassuming booths line the restaurant. Signs with cheesy sayings like “I like my cream and sugar with a touch of coffee” pepper the walls. Expect surprisingly quick, friendly service and constant refills on coffee. 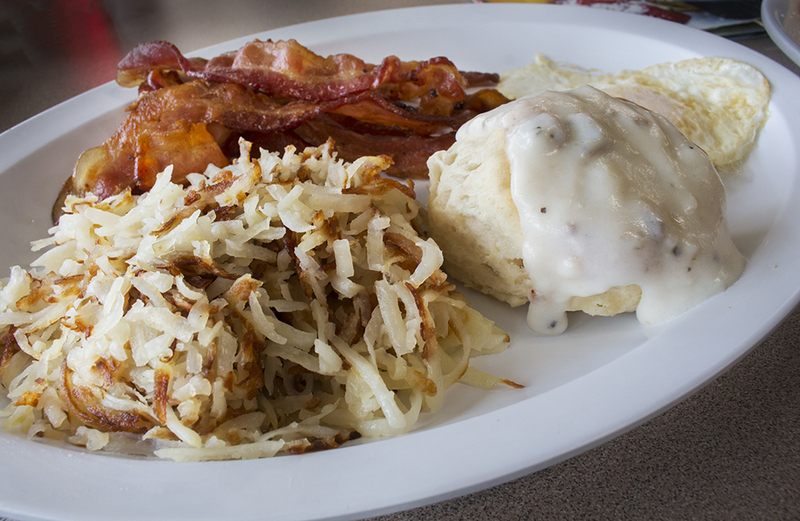 What to order: The Workingman’s breakfast comes with an egg cooked just how you like it, hash browns, your choice of meat and half an order of biscuits and gravy. The bacon is perfectly cooked — not too crispy, but not rubbery, either.